After the second week of the NRL, all the hasty predictions we made after Round 1 have been decisively torn up and the subplots we spotted gathered pace. The round kicked off with the Bunnies taking an early lead in the running to be the prematurely-confirmed premiership winners, the resurgent Cowboys of last week were decisively shut down by a Broncos with a point to prove, the Chooks made hard work of an inconsistent Manly in what can only be described as apocalyptic conditions at Brookvale, the Panthers and Sharks bounced back from poor opening games and the Dogs were not much better, sadly. But to reduce all of the action into an arbitrary team of the week is what we’re here for, so let’s get into it. Weekly rule reminder: players in the team are being picked in the position they played on the given week, interchange players in the TOTW will be made up of players that actually played off the interchange, and I didn’t watch all 80 minutes of every game so I probably have missed a few under-the-radar gems – hit me up, let me know. A man who has had a certain amount of pressure on his shoulders in the off-season, as the expected jokes about having no Wayne Bennett to pick him came rolling in and the shadow of Jamayne Isaako started to creep over his fullback jersey. But, in big games, the cream rises to the top. 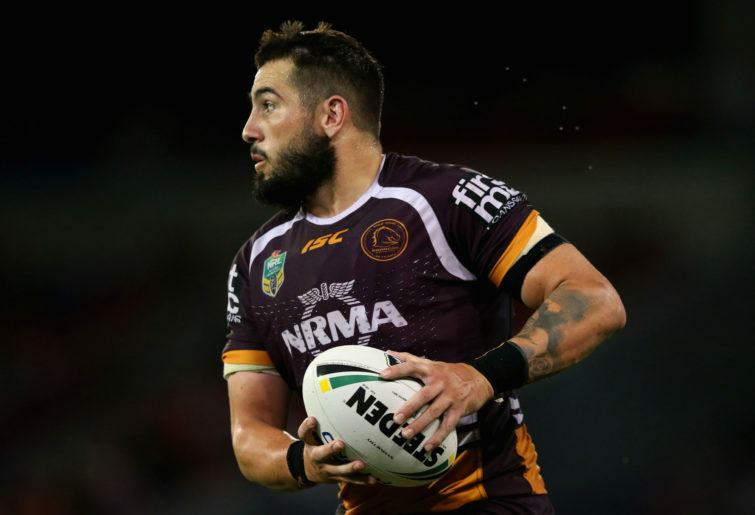 Darius was integral in his side’s derby win over a Cowboys team with a point to prove. 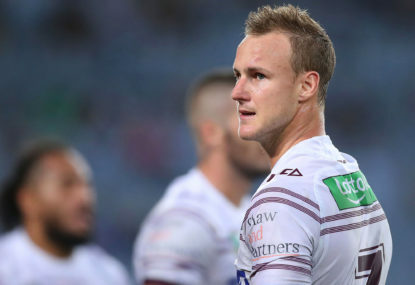 He was rock solid at the back, found important metres on kick returns that are not always in his game, and marshalled his team well in a pressure-cooker atmosphere, fighting off Matt Moylan for a spot in my team this week. Now, keeping this up is going to be the challenge for him. Air Suli is back in business. 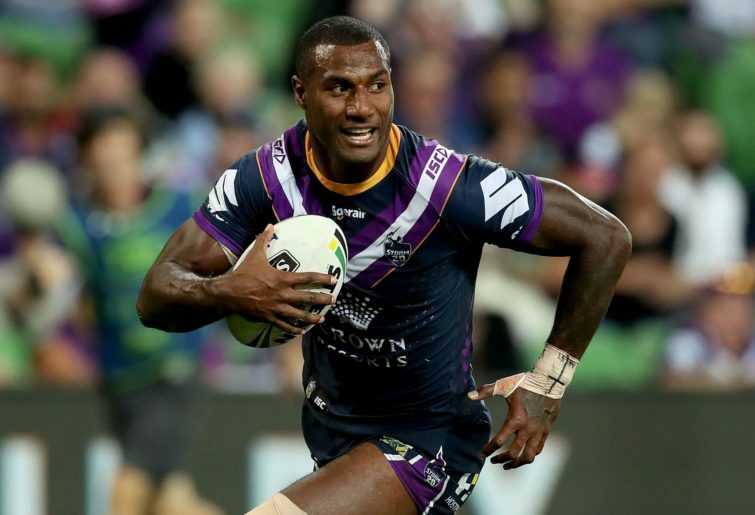 After a pretty quiet opener by his standards, the Fijian flyer found his form in the nation’s capital as the Storm rolled over a confident Raiders side with minimal fuss. A first-half hat trick was enough to see his side comfortably clear, and he added on 130 metres and six tackle busts for good measure. We all know what to expect from Suli at this point, but there is little that opposition defences seem to be able to do about it. When you’ve got a guy with that much strength with ball in hand who is also that good in the air, it’s almost impossible to set a plan for and provides the Storm’s playmakers with so many options. Good choices to have. The Tigers are one of the sides that look set for a much bigger year than they had in 2018. Michael Maguire has come in and filled his team with confidence, steeled up their defence and set up their attack to hurt teams. One man who did shine in 2018, however, was Esan Marsters, and the new Kiwi international is showing no signs of slowing down. He couldn’t grab a try – which some have pointed to as the thing missing from his game last year – in their big win over a fancied Warriors outfit, but his strong lines in attack to go with a superb try-saving tackle on Ken Maumalo and a solid kicking performance are enough to see him into this team. Jarrod Croker and Braidon Burns may consider themselves unlucky here. I could have picked either of the Broncos centres here but I’ve gone for Bird mainly on the basis of proving once again how much difference a year can make. This time last year, Bird arrived in Brisbane with major question marks over his fitness and lifestyle and had many questioning his place in the side at all by season’s end. This term, however, he looks fit, confident and ready to get back to his Cronulla form when he took the competition by storm. His awareness to set up Corey Oates for his first try – and his second, come to that – is a sign of a man playing good footy and his work in contact is vastly improved. A big year beckons. A player who came into a new club with big expectations, Blake Ferguson has established a reputation over the last few seasons as one of the premier metre-eaters in the competition. That was what he was brought into the Parramatta set-up to provide, and he did that and more against a struggling Bulldogs. 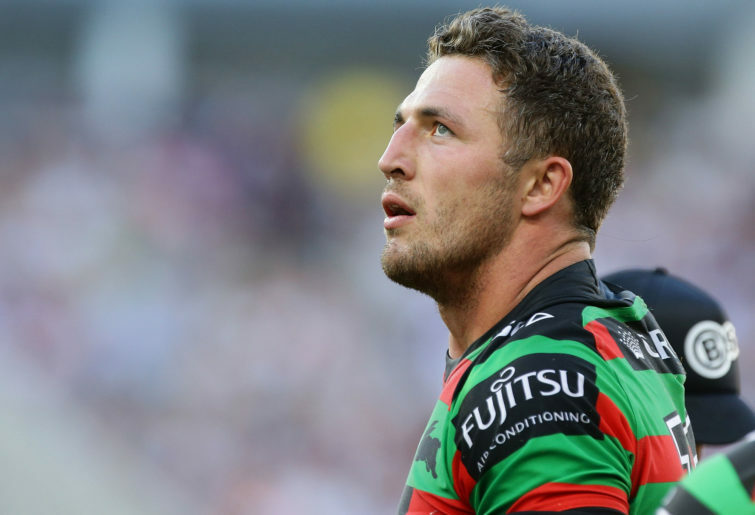 Two tries, 298 metres, a try assist, ten tackle busts – big Blake’s performance had it all. His ability to bring the ball out of his own end is frightening and the only winger who can probably match that impact was the man who was again unlucky not to claim this spot for the second week in a row, Corey Oates. The rugby league oracle, Matty Johns, has said repeatedly this week that Cody Walker is one of the most natural footballers going. That is a debate-worthy statement, to be sure, but one thing that is indisputable is that when the Bunnies are flying, you often find a top-gear Cody in the middle of it. On Thursday night, he was the Dragons’ worst nightmare and just seemed to have the ball on a string at times. His partnership with Adam Reynolds is so important to South Sydney and if Wayne Bennett can keep those two on top form, with big forwards firing in front of them, there’s no reason Souths can’t live up to the inevitable early-season hype and make a serious tilt at the premiership. There have been many players down the years that have turned up under big pressure in an Origin or grand final and struggled to live up to that hype down the track. It was pretty clear after about ten minutes of the Roosters’ game at Manly that Luke Keary – once again thrust into the primary playmaker role – was not going to be that guy. A four-assist first half was enough to have him not even pencilled but permanent-markered into this team by half-time. 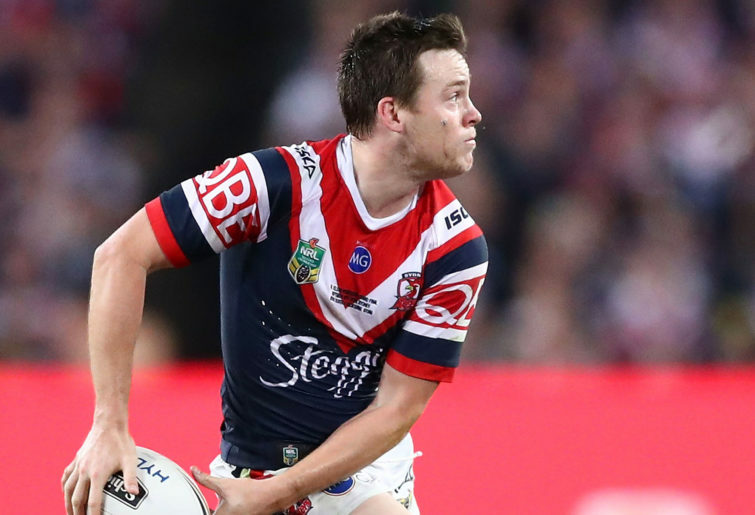 Whether with ball in hand or on foot, Keary is in sensational form and it was no coincidence that the Roosters dropped off when he left the field. Keary is a huge chance of donning the No.6 jersey for NSW in a few months’ time. Coincidentally, it’s the incumbent Blues halfback Nathan Cleary that deserves an honourable mention here. It was billed all the way up as the battle of the big men. Tevita vs Taumalolo was the big subplot to the Queensland derby and, even before Taumalolo was forced from the field injured, the Broncos tyro had provided solid enough evidence that he had won that battle. His first major contact was to absolutely sit last week’s 300-metre hero on his backside and he did not look back from there. He was crucial in absolutely dominating arguably the best forward pack in the competition and nothing summed up his firepower more than the pure determination he showed in getting over for a try of his own. What the Blues set-up must have been feeling when he committed to Tonga we can only imagine. If ever there was a case of someone winding back the clock, this season so far has been exactly that for Robbie Farah. His return to the Tigers after such an emotional exit a few seasons back was met with raised eyebrows by some but he is fully showing that he still has plenty to offer. If it is to be his last season in the NRL, he’s going out in style so far. A try to go with two last week, three assists and 34 tackles, as well as just generally popping up everywhere. At one point in the game, he had four involvements in the same play – that’s some serious workload for an old horse. Backing up big performances is what sets the big-time players apart, and that is exactly what big Dave has done so far in Newcastle. Another barnstorming performance for a Knights side that fell just short of bringing it home against the Panthers. Almost 200 metres and 34 tackles with nothing missed in a 63-minute performance. They say numbers don’t tell the whole story and they don’t, but these particular ones give a pretty good sum-up of what Klemmer is doing up in the Hunter. 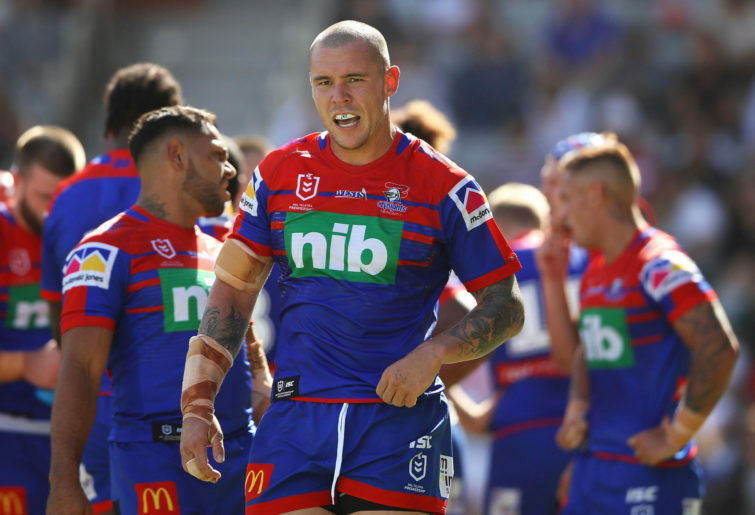 He’s superbly leading a Knights pack that lacked leadership last year and he is going to be a major force in their shot at the eight this year. 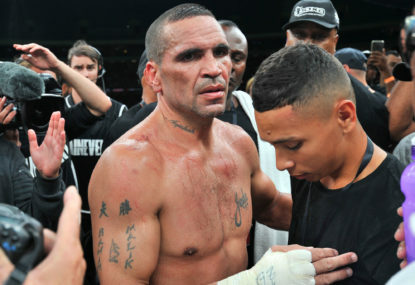 All they need to do is keep him fit – and ideally, out of Origin – but we all know that probably won’t happen. Another player who arguably had his breakout year in 2018, James Fisher-Harris capped off his year with a much-deserved Kiwi call-up and appears to have carried his form into 2019. A defensive workhorse by trade, JFH appears to have also added a bit more bite into his attacking game under Ivan Cleary and was a big cog in the Panthers grinding win over the Knights. One try, 36 tackles and 100 metres is a strong output for an edge forward and it just goes to show what we have come to expect from this man. He was pushed by the likes of Boyd Cordner and Briton Nikora for this spot but eventually got over the line. It’s funny to think there were those that didn’t reckon Sam was going to be the same player when he came back from his ill-fated stint in rugby union but they’ve been proved emphatically wrong. He may not be a Golden Boot winner again but there is no doubt he is still the forced to be reckoned with. 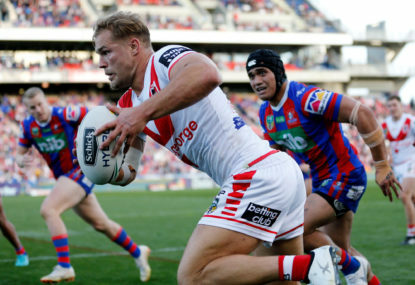 The Dragons didn’t know how to handle him on Thursday night, as he steamrolled for two hard-earned tries and 160 metres. Add in the gorgeous offload that laid a try on a plate for Cody Walker and you have a sign of a man getting back towards his best. And doesn’t it show for the Bunnies when he is? I was eyeing up John Bateman for this spot originally as a reward for the very impressive start he has made in the NRL, especially for playing 80 minutes at lock which is no mean feat in this competition. But, on reflection, the impact that Jai Arrow managed to bring for a Titans pack that otherwise might have been seriously overrun gets him in. A line break, 290 metres, 29 tackles, seven tackle busts and four offloads in 70 minutes – put the name of Jason Taumalolo next to those numbers and no-one’s batting an eye. Arrow is clearly looking to build on a breakout but nonetheless injury-hit 2018 and looks good value to keep his Origin jersey intact. Who’s to say he can’t get an upgrade into the No.13 shirt if he keeps playing like this? It’s never easy as a youngster to come onto the field for your NRL debut with the amount of hype that has been laid on Lachlan Lam and impose yourself so easily on a game, but that’s exactly what he managed. 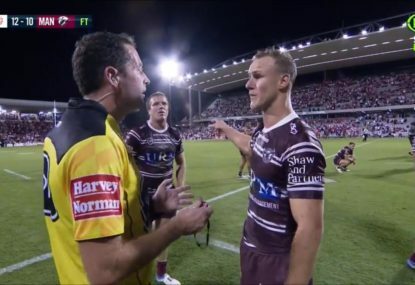 Coming into an absolute monsoon against Manly, Lam didn’t over-do his involvement but showed great judgement to just inject himself when he saw the chance and wasn’t afraid to take things on. His kick to set up Boyd Cordner’s second try was perfectly weighted and the kind of skill that even seasoned NRL halves can’t often make look that easy. The Roosters will now surely be secure in the knowledge that if Cronk or Keary does go down in the course of this season, they have a talented kid in the wings ready to make his case. I confess I was one of the people that raised their eyebrows and asked ‘Why?’ when Aaron Woods ducked out of his Bulldogs deal to join the Sharks. 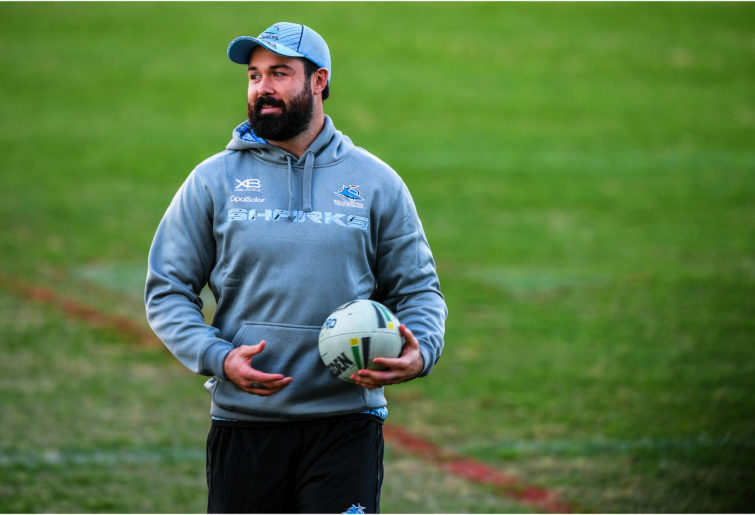 I didn’t necessarily blame him for the move, but the choice of Cronulla confused me – why would a guy with that reputation settle for a bench spot somewhere else? But I have been proved wrong, and I have been quietly impressed with Woods’ performances off the pine for the Sharks. He still plays big minutes and is a crucial part of the Sharks being able to firm up their middle defence at crucial times in games. Against the Titans, it was no different – 30 tackles, 126 metres and three offloads in 45 minutes. Not a bad knock, Aaron. This kid looks like a beast. 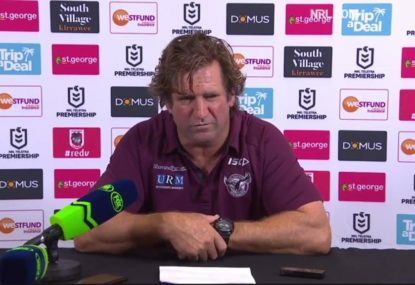 Some worried about the hit to the Broncos’ interchange when Payne Haas was ruled out of the opening rounds of the season, but they should not have feared – Flegler looks like an absolute tyro in a Broncos pack that seems full of them. He ripped into the Cowboys from the moment he got onto the field and built off a solid debut last week to put in a performance that picked up where Tevita Pangai Jr left off – and that is some compliment. In 37 minutes he managed a line break, 22 tackles and 196 metres. Bananas. The Cowboys, conversely, couldn’t find much go-forward at Suncorp and their defence was ragged. It’s a concern for Paul Green that his side’s defensive mojo got put out so easily and we can be sure that we will see a response from them. However, there was a bright spark to be found in their miserable game and it was the performance off the bench from young Mitch Dunn. An edge player by trade, the injury to Nene Macdonald saw him reshuffled essentially into five-eighth and he took the chance well. Any good attacking play the Cowboys mustered in the game came through him as he managed to cause a relatively comfortable Broncos side some problems. He also got through good defensive work – one of the few who can claim that on the night. A good prospect for Paul Green to have.